The TierraCast bracelet findings we offer here at Antelope Beads are rustic, distinct, and durable. Offered in a variety of metals like gold, copper, and silver, TierraCast jewelry findings will fit the style and design of any custom made jewelry. Try one of our TierraCast bracelet clasps to add a classic, simple hook to keep a bracelet or necklace in place. Pair it with some detailed, TierraCast bracelet charms for a fun, unique look. 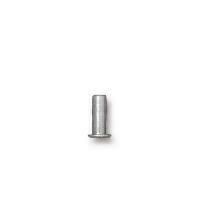 TC-01-0060-11 - Cap Dia 4mm, Tube OD 2.4mm, Post Length 5mm, Eyelet Head OD 4.6mm. Set Eyelets with the TierraCast Tool 4mm Rivet SetterTC-79-0103-00. Click product image to see video tutorial. These Rivets are best used for double layer designs. Two layers of leather or Leather and a Component. 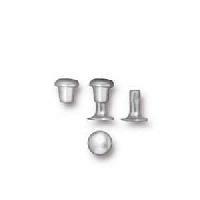 TC-01-0060-13 - Cap Dia 4mm, Tube OD 2.4mm, Post Length 5mm, Eyelet Head OD 4.6mm. TC-01-0060-18 - Cap Dia 4mm, Tube OD 2.4mm, Post Length 5mm, Eyelet Head OD 4.6mm. TC-01-0060-25 - Cap Dia 4mm, Tube OD 2.4mm, Post Length 5mm, Eyelet Head OD 4.6mm. TC-01-0060-27 - Cap Dia 4mm, Tube OD 2.4mm, Post Length 5mm, Eyelet Head OD 4.6mm. TC-01-0060-45 - Cap Dia 4mm, Tube OD 2.4mm, Post Length 5mm, Eyelet Head OD 4.6mm. 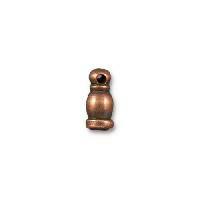 TC-01-0061-11 - Cap Dia: 6mm Tube OD: 2.5mm Post Length: 7mm Eyelet Head OD: 5mm. Set Rivets with theTierraCast Tool 6mm Rivet SetterTC-79-0104-00. Click product image to see video tutorial. These Rivets are best used for mulit layer designs. Leather and 2 Components or 2 layers of leather and a component. These Rivets are best used for multi layer designs. Leather and 2 Components or 2 layers of leather and a component. Set Eyelets with the TierraCast Tool Set Eyelet Setter and AnvilTC-79-0102-00. See video tutorial below. These Eyelets are best used for single layer designs. Set Eyelets with the TierraCast Tool Set Eyelet Setter and AnvilTC-79-0102-00 See video tutorial below. 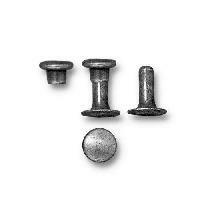 These Rivet Eyelets are best used for single layer designs. 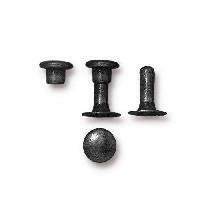 These Rivet Eyelets are best used for double layer designs. 2 layers of Leather or Leather and Component. 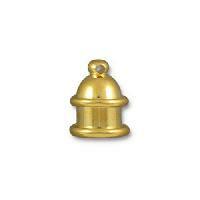 Use TierraCast Micro Washer 6mm - Gold Plated TC-01-0070-25 to secure components. Set Eyelets with the TierraCast Tool Set Eyelet Setter and AnvilTC-79-0102-00. See video tutorial. 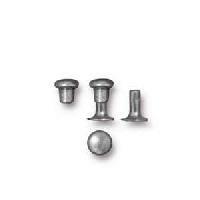 These Rivet Eyelets are best used for double layer designs. 2 layers of Leather or Leather and Component. Use TierraCast Micro Washer 6mm - Silver PlatedTC-01-0070-11 to secure components. 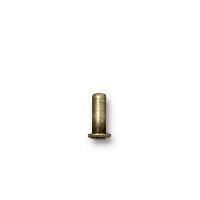 TC-01-0082-13 - Length: 5.3mm Head: 2.2mm Made from Brass. These Rivet Eyelets are best used for double layer designs. 2 layers of Leather or Leather and Component. Use TierraCast Micro Washer 6mm - Black PlatedTC-01-0070-13 to secure components. These Rivet Eyelets are best used for double layer designs. 2 layers of Leather or Leather and Component. Use TierraCast Micro Washer 6mm - Antique CopperTC-01-0070-18 to secure components. These Rivet Eyelets are best used for double layer designs. 2 layers of Leather or Leather and Component. 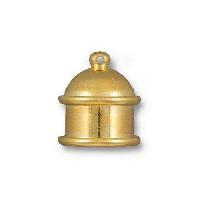 Use TierraCast Micro Washer 6mm - Antique Brass TC-01-0070-27 to secure components. These Rivet Eyelets are best used for double layer designs. 2 layers of Leather or Leather and Component. Use TierraCast Micro Washer 6mm - Antique SilverTC-01-0070-40 to secure components. Set Eyelets with the TierraCast Tool Set Eyelet Setter and AnvilTC-79-0102-00. Click product image to see video tutorial. This size Eyelet is best used for multi layer stacking designs. 2 layers of Leather and a Component or leather and 2+ stacked Components. Use TierraCast Micro Washer 6mm - Gold PlatedTC-01-0070-25 to secure components. This size Eyelet is best used for multi layer stacking designs. 2 layers of Leather and a Component or leather and 2+ stacked Components. Use TierraCast Micro Washer 6mm - Silver PlatedTC-01-0070-11 to secure components. This size Eyelet is best used for multi layer stacking designs. 2 layers of Leather and a Component or leather and 2+ stacked Components. Use TierraCast Micro Washer 6mm - Antique Brass TC-01-0070-27 to secure components. This size Eyelet is best used for multi layer stacking designs. 2 layers of Leather and a Component or leather and 2+ stacked Components. 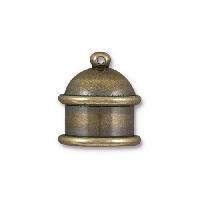 Use TierraCast Micro Washer 6mm - Antique SilverTC-01-0070-40 to secure components.